Montrealers are invited to build a giant replica of the Jacques Cartier Bridge – out of cardboard! Montreal, August 29, 2018 – Montreal is about to get its second Jacques Cartier Bridge, only the new one will be made out of cardboard and located in the heart of the Quartier des Spectacles! A replica of the iconic Montreal structure, 35 metres long by 10 metres high, will be erected without cranes or tools – only the incredible collective strength of the public and the talent of French artist Olivier Grossetête. Made entirely out of cardboard, the work, titled Construisons Monumental!, is sure to inspire a sense of awe and wonder. Never before has the city witnessed the construction of such a large temporary work. The public is invited to help build the cardboard bridge, as well as dismantle it afterwards, on September 15 and 16 in Place des Festivals, as part of a massive public party. Construisons Monumental! is presented by the Quartier des Spectacles Partnership and Les Escales Improbables de Montréal, now in their 15 th season, with the support of Cascades, the Consulate General of France in Quebec and The Jacques Cartier and Champlain Bridges Incorporated, and in partnership with Place des Arts. This human and artistic experience is unprecedented in Montreal. It is the brainchild of French artist Olivier Grossetête, who has made his mark in several cities around the world by creating temporary architectural works out of cardboard, as part of a larger social and artistic experience. With the collective energy and enthusiasm of the community as the driving force, this time out he is offering Montrealers the chance to construct a unifying project as monumental as it is lightweight. “My work revolves around fun group activities that show how much you can accomplish with pooled skill, intelligence and energy. At the same time, I examine the symbolic aspects of architecture, an art that is usually imposed on us, and that is completely beyond our grasp. Instead, my projects put the human being at the creative centre. It is also a big creative game that we make together and demolish together, with childlike glee,” said Olivier Grossetête. The first phase of this monumental project will take place from September 10 to 14 at Place des Arts, with ten pre-construction workshops designed to prepare the structure’s various elements. In all, more than 300 adults and children from Montreal and elsewhere, some of them recruited through local social and cultural organizations, will have the opportunity to observe the artist’s creative process, learn architectural concepts and get directly involved by cutting out and assembling the boxes that will comprise the bridge. There are still a few places available in these free workshops. Don’t wait to register! Saturday, September 15 at 10 a.m. marks the start of assembly of the bridge components, culminating in the erection of the monumental cardboard structure. Construction of the bridge will require a full-day collective effort, with dozens of people involved at all times. Montrealers are invited to come play “builder” for a few hours, even if they did not attend the workshops. Everyone is welcome to pick up a box and help build the bridge! Through this collaborative process, any Montrealer can watch or participate in the creation of a spectacular work, helping immortalize a unique moment in the life of the city. The construction of this temporary cardboard artwork is a collective process – and so is its demolition! The day after it goes up, Sunday, September 16 at 4 p.m., the public is invited to a gleeful mass-demolition session. In a spirit of neighbourly fun, everyone is invited to join in dismantling the structure until it has been thoroughly stomped under the crowd’s feet. Those in attendance will be able to take home a piece of “bridge” as a souvenir. To keep the project environmentally responsible, all cardboard is donated and recycled by Cascades. Olivier Grossetête is a visual artist from France. His installations, videos, collages and monumental structures bring poetry and dreams to life and into our lives. With playful false naiveté, Grossetête uses each new situation to question the laws, both physical and social, that govern us. He has created monumental cardboard structures on several continents, including Guadalajara (Mexico), Landernau and Martigues (France), Newbury and Hull (U.K.) and Shenyang (China). The mission of Les Escales Improbables de Montréal is to support, develop and produce a multidisciplinary, intergenerational, creative and social reality for art in the city and in residents’ lives. Since its inception in 2004, the organization has built expertise that makes Les Escales Improbables a pioneer in the organization of participatory activities for all audiences. It creates settings for the living arts focused on the social and human dimensions, in which artists, venues and audiences come together, and spectators are invited to participate rather than simply watch. Working with local and international artists, Les Escales Improbables promote sharing around diverse projects that give us new artistic perspectives on the city. 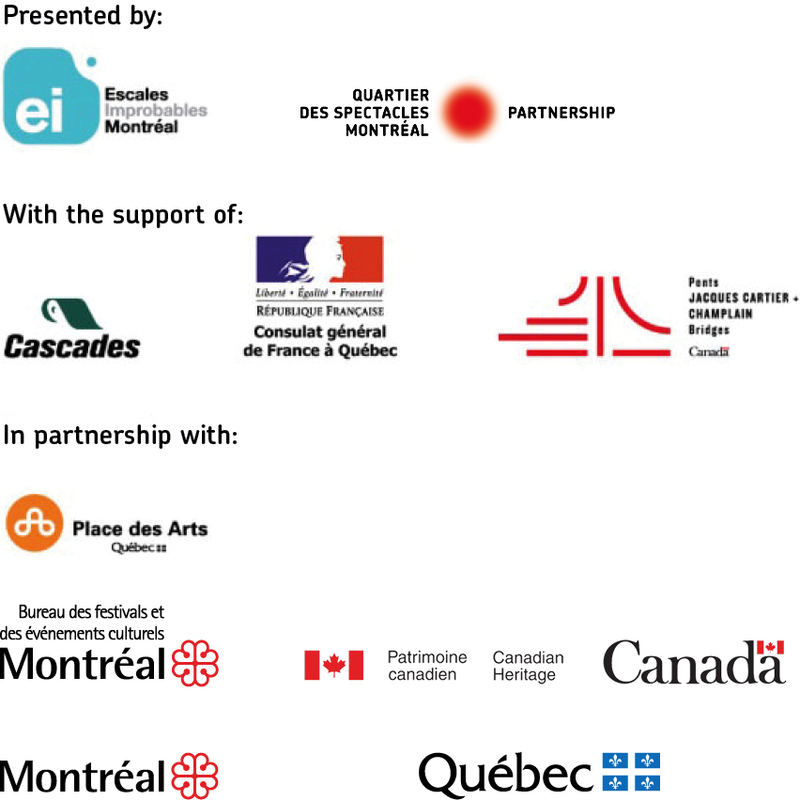 For the last 15 years, Les EIM have also engaged in collaborations with the Montreal community and produced projects seen in Quebec as well as Europe, North America and Africa.